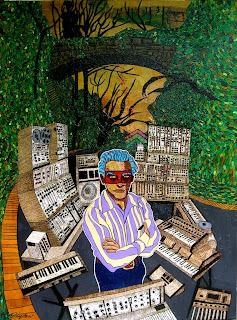 New Mark May and Gabriel Shaffer works posted on Outsiderfolkart.com! affordable ticket price of $50.00. the fair in future years." Gallery (Santa Fe, N.M) and Wexler Gallery (Philadelphia). 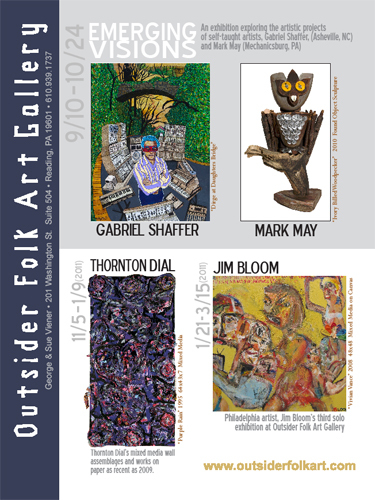 information, visit www.sofaexpo.com and www.outsiderfolkartfair.com. Even a couple of years ago, when he was laid up in a hospital bed with a kidney ailment, Purvis Young never quit railing against the injustices that fueled his work. In the summer of 2008, Miami’s best-known artist told New Times that the presidential primaries were providing fertile fodder for a new body of work. “Sitting in the hospital bed watching all the news about the upcoming election has been keeping me up-to-date as these political events unfold — all the wiles and doublespeak and backstabbing is going to inform my work when I am back painting,” Young declared. Born and raised in Overtown, Purvis Young began painting after serving a three-year prison sentence for burglary in his early 20s. He soon became known for raw, evocative scenes of angels, Zulu warriors, railroad tracks, and wild horses depicted on termite-riddled wood, rotting doors, scraps of metal, and other urban detritus. This past April, Young, who was an urban storyteller without peer, died at age 67, and now he’s the subject of a modest retrospective at Miami Art Museum running through November 7. EVER stand in a museum or gallery looking at a work of art and wonder: “Gee, what were they thinking?” Some artists are willing to answer that question in person, and dozens, including the photographer Tom Steele, the multimedia artist Avital Oz and the painter Roseline Koener, will meet participants in a self-guided tour of artists’ studios in the greater Westhampton area next weekend. The tour is being presented for the second year by Family Counseling Services in Westhampton. ON VIEW “Cracked,” by Candyce Brokaw, can be seen on the studio tour. Ms. Brokaw is not only a participant: the tour was her idea, she said in a recent telephone interview. 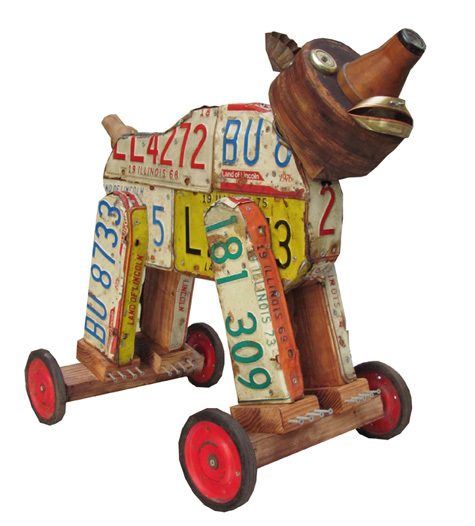 She was inspired by the annual tour run for the past 25 years by the Artists Alliance of East Hampton. “I always felt that our area had a lot of very good artists that needed to share their art with the community as well,” Ms. Brokaw said. With the help of a fellow artist, Pam Capozzola, Ms. Brokaw started the newer tour, which covers the area from East Quogue to East Moriches. Visitors may drop by any or all of 18 locations, including more than a dozen private studios and galleries, like the Full Moon Arts Center, where several artists will be grouped. About 50 artists will participate, and many will be working. Proceeds from the tour benefit Family Counseling Services, which provides a variety of mental health services with fees on a sliding scale based on income. “My stuff is really out in left field,” she added. But next weekend, she may be willing to explain some of it. Greater Westhampton studio tour, Aug. 14 and 15, 11 a.m. to 4 p.m. Tickets, $35, at familycounselingsvc.org; at Galerie BelAge, (631) 288-5082; and at a reception at Full Moon Arts Center, East Moriches, on Aug. 13, 5 to 7 p.m. Please note the Outsider Folk Art Gallery will be closed this Saturday, August 7th, and will not be opening Sunday, August 8th for the Goggleworks 2nd Sunday Open House. Correction- Mark May sculpture pictured: "Great Horned Owl"
Mark May "Great Horned Owl"
Gabriel Shaffer "To Water My Ashes Thrash"
An exhibition featuring self-taught artists Gabriel Shaffer (Asheville, NC) and Mark May (Mechanicsburg, PA), “Emerging Visions” seeks to examine and explore the artistic projects of these dynamic young visionaries. Self-Taught Artist Mark May (b. 1979) has been showing at the Outsider Folk Art Gallery since it opened in 2005. From a young age Mark has had an appreciation for the history and communicative power of objects, forming collections from flea-markets, yard sales, and junk yards. 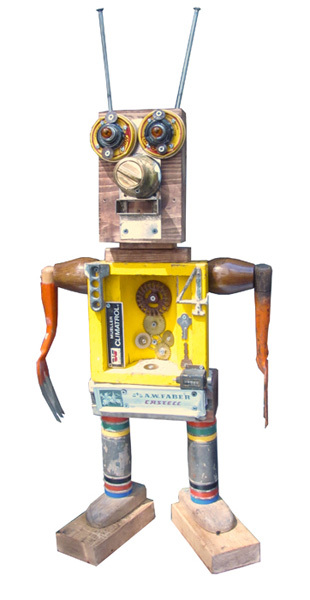 Soon, he began assembling his found objects and materials to form sculptures, creatures and robots. The creative process was meditative and fun, but also more deeply meaningful, and alchemical, to Mark. A special-education teacher, May realized the potential for his dynamic creations to communicate with his students, and began leading robot workshops with children. Extremely prolific, Mark has recently begun a series of large sculptures containing a more focused and nuanced presence. Gabriel Shaffer (b. 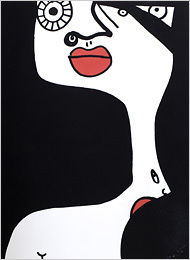 1975) exhibited for the first time with the Outsider Folk Art Gallery in the 2007 group exhibition titled “It’s in the Genes”, along with his mother, nationally renowned folk painter Cher Shaffer. Gabriel’s mixed media works employ layers of paint, graffiti, and collage to depict fictional or mythic characters, and evoke colorful intersections of sound, imagery, and poetry. The printed matter Shaffer collages into his work is gathered from a variety of sources including dumpsters, abandoned hospitals, factories, or houses, music books and more. Shaffer began exhibiting his earliest works in January 2004, and has been received with notable acclaim nationally and internationally. 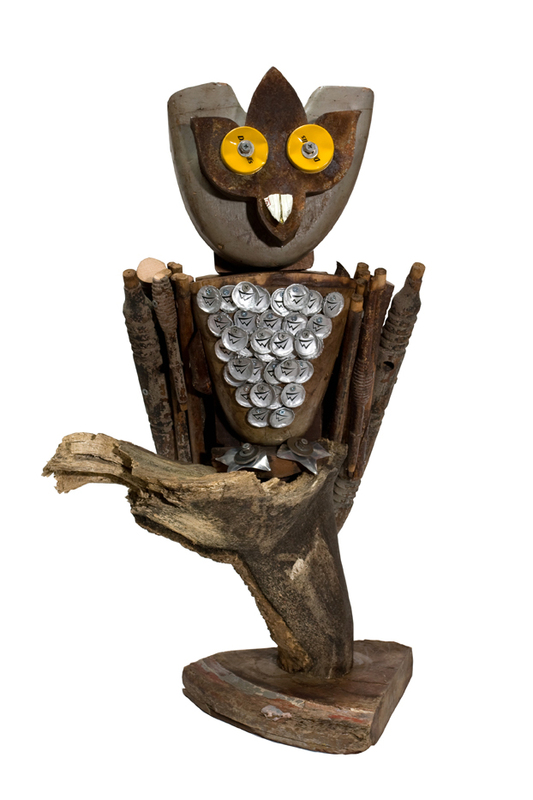 Each of these self-taught artists has grown up in and around artistic traditions that are central to the focus of the Outsider Folk Art Gallery, and yet each has evolved in his own direction. Gabriel Shaffer had contact with many folk and outsider artists as a young boy, since his mother, Cher Shaffer is a self-taught artist. Cher and Gabriel both revere their Native American heritage through painting. Gabriel also cites artists such as Thornton Dial and Purvis Young as inspirations to him. But Shaffer draws from many other areas of influence as well. A poet and musician before finding his focus in visual art, Shaffer’s work is informed by knowledge and experiences in cultural worlds extending beyond folk art. 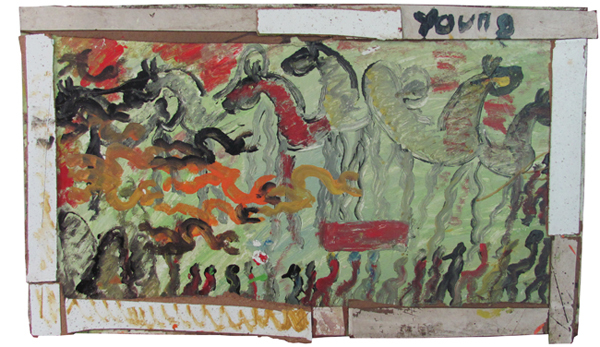 Yet, Folk, and so-called Outsider Art, remain close to his heart and a central part of his identity. Mark May grew up in a home filled with antiques, Americana, and interesting objects, since his mother is also a collector. To Mark, objects can have a presence to them, which he has an ability to feel. He sometimes puts objects together in a light-hearted, witty way, as with his clever and endearing robots, which take on vivid personalities through the sum of their parts. At times, while maintaining this buoyant quality, the work pulls from a deeper place. Mark senses a meaningful connection between the different components that he assembles into a sculpture, and this sense of destiny between them interlaces with his own life, as he may come across objects at different times, in different places, whether he is looking for them or not. When May collects an object he is drawn to, he may not know in what way he will use it until it reveals itself to him, often through sensing a synergy with other objects. Mark is a member of the Philadelphia Dumpster Divers, the found-object artist group, and was part of the 2009 show “Ecologically Correct: The Philadelphia Dumpster Divers” at the Outsider Folk Art Gallery. “Emerging Visions” marks the first major showing of each artist at the Outsider Folk Art Gallery, and will display recent works created for the exhibition. The Outsider Folk Art Gallery, located on the 5th Floor of the GoggleWorks Center for the Arts, is owned by Reading, PA natives George and Sue Viener, long time collectors of folk, outsider, and self-taught art.